The Droughtmaster is so named because of its ability to stay fat and healthy during drought conditions. Initially developed in the 1930’s in North Queensland, the Droughtmaster does well with the low protein found in natural pastures during the dry season (Oct–Dec) and is also able to withstand ticks. 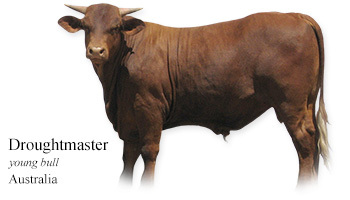 Due to its good temperament, the Droughtmaster is easy to manage and is used for crossbreeding. Although the calves are usually small at birth, they soon catch up in growth. zebu bulls X Shorthorn, Hereford cows and Shorthorn-Devon cross cows (+ Brahman cattle after 1930’s). My Daily Cow® Australia and read about other Australian cattle breeds.